Independence Blue Cross (Independence) hosted Michael Sapienza, CEO of the Colorectal Cancer Alliance (CCA), and area business leaders for a breakfast discussion about the importance of preventive screening and early detection of colorectal cancer. 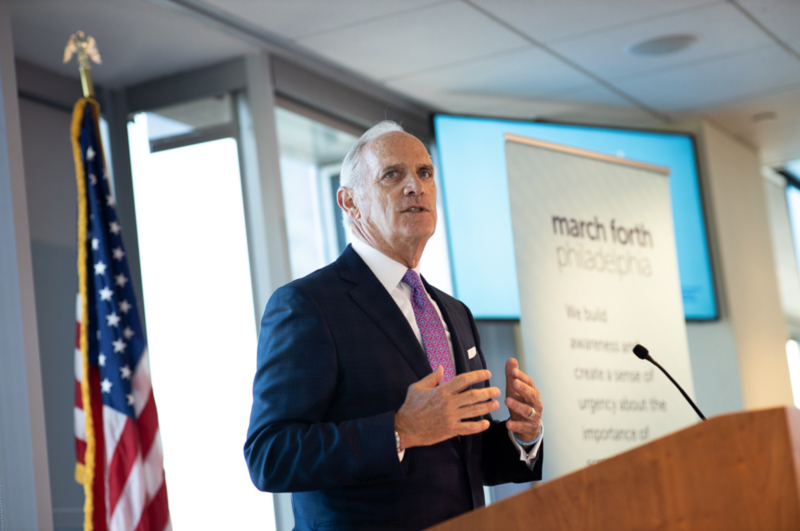 At the meeting, Independence CEO Daniel J. Hilferty announced that Independence will support the March Forth Philadelphia Prevention Project, which seeks to save lives by promoting increased colorectal cancer screening in the Philadelphia region. Colorectal cancer claims more than 50,000 lives each year in the United States, yet it is highly preventable. Screening and early detection can save lives. The colorectal cancer screening rate in some Philadelphia communities, however, is nearly 25 percent lower than the national average of 67 percent, according to the Centers for Disease Control 500 Cities Project. Philadelphia has a lower screening rate than other cities with contributing factors such as poverty and access to care. The grant will assist in funding the prevention project’s four-pronged strategy to increase screening rates, which includes supporting patients and families, conducting outreach to vulnerable communities, raising awareness, and educating and collaborating with health systems.